Since his rookie season in 2007-08, Capitals center Nicklas Backstrom has risen to become one of the league’s best and most underrated playmakers, and the greatest in franchise history. 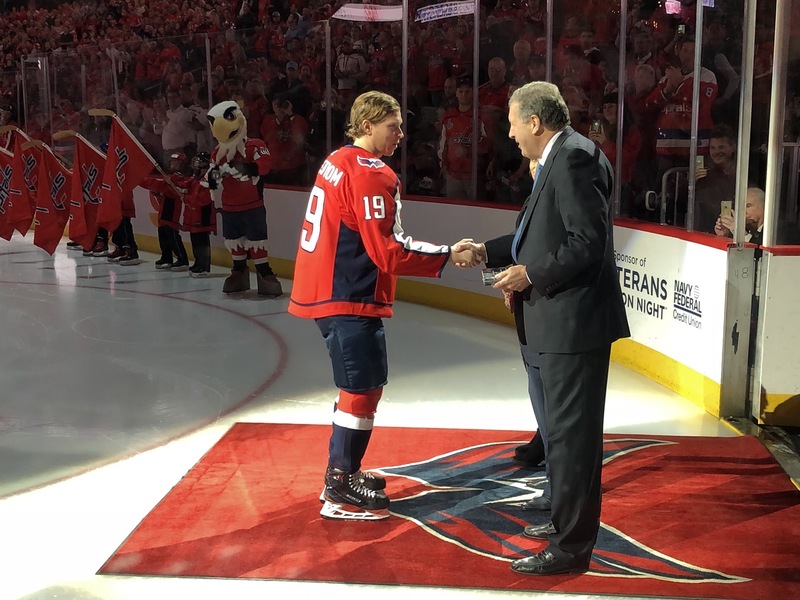 And after recording his 600th career assist in the Capitals’ game against the Vancouver Canucks on October 23, the team honored Backstrom with a pregame ceremony prior to the Capitals’ Wednesday night tilt with the Pittsburgh Penguins. 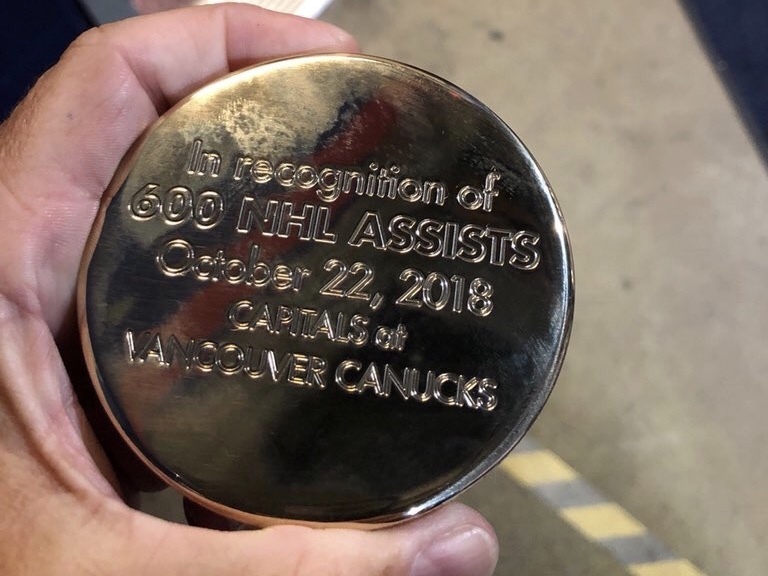 Backstrom reached and surpassed the 600-assist mark in the Capitals’ October 23 game against the Canucks, in which he recorded three helpers, with his 600th assist coming quite fittingly on an Alex Ovechkin power play goal. Backstrom is just the 87th player in NHL history to reach the 600 mark in assists. The Capitals presented the former first-round pick (sixth overall in 2006) with a crystal, and played a video tribute on the overhead scoreboard, with messages from Backstrom’s family members in Sweden, several of his current teammates, and four of the greatest Swedish players in NHL history, Peter Forsberg, Mats Naslund, former Capital Ulf Dahlen, and Mats Sundin. Capitals majority owner Ted Leonsis also presented Backstrom with a golden puck. 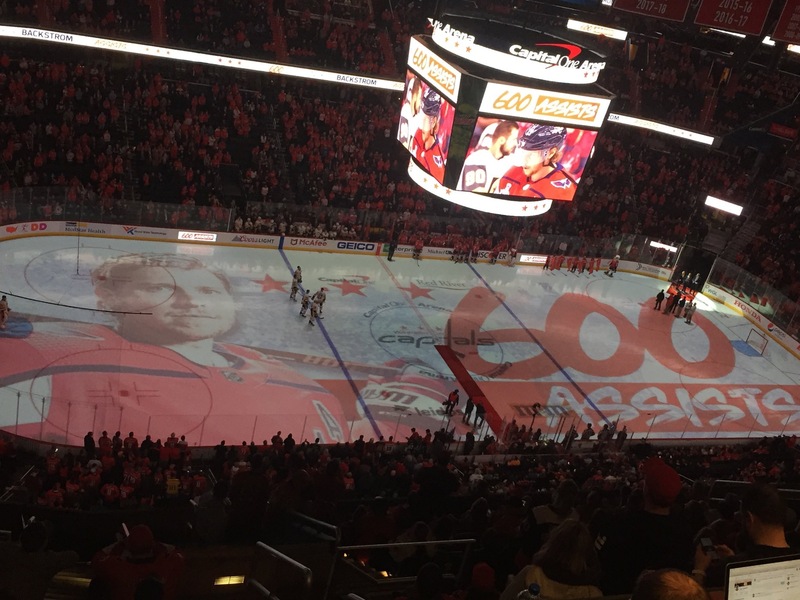 The Capitals also projected a special graphic onto the ice during the video tribute. At the end of the second period of the team’s game against Pittsburgh, Backstrom had added another assist on an Ovechkin power play goal, his 14th of the 2018-19 season. This entry was posted in History, News, NHL, Players, Washington Capitals and tagged 600 Assists, Assists, History, Michael Fleetwood, Nicklas Backstrom, Pregame Ceremony, Washington Capitals. Bookmark the permalink.